Eric Anthony Mangini (born January 19, 1971) is an American football coach who last served as the defensive coordinator for the San Francisco 49ers of the National Football League (NFL). Mangini had been with the 49ers since 2013 and served as the team's tight ends coach for two seasons before being promoted to defensive coordinator in 2015, only to be fired in 2016 by new head coach Chip Kelly. Mangini, facetiously known as "the Mangenius," is a former head coach, having served as the coach of the New York Jets from 2006 until 2008 and the Cleveland Browns in 2009 and 2010. Prior to taking his position with the 49ers, Mangini was an NFL analyst for ESPN. Since being fired by the 49ers, Mangini has become an analyst for Fox Sports 1. Mangini is known for being a former assistant under Bill Belichick, serving under him as a defensive assistant while Belichick was the defensive coordinator with the Jets and later following him to the New England Patriots, where he succeeded Romeo Crennel as defensive coordinator in 2005 after Crennel took the head coaching position with the Browns (a position he would also be succeeded in by Mangini). Mangini was a linebacker at Bulkeley High School in Hartford, Connecticut. Mangini played nose tackle at Division III Wesleyan University and holds the school's single-season (11.5) and career (36.5) sacks records. During the second semester of his junior and senior years, he coached the Kew Colts, a semi-professional football team in Melbourne, Australia, to two regional championships. Mangini joined the Chi Psi Fraternity that coaching mentor Bill Belichick, another Wesleyan alumnus, was part of two decades earlier. Mangini first caught the attention of Bill Belichick, under whom he would coach for nine seasons, as a 23-year-old ball boy with the Cleveland Browns. His work ethic impressed Belichick, and the head coach was instrumental in promoting Mangini to a public relations intern, and later, an offensive assistant. After spending 1996 as an offensive assistant with the Baltimore Ravens, Mangini rejoined Belichick and spent three seasons as a defensive assistant with the New York Jets. When Belichick was hired as the New England Patriots head coach in 2000, he brought along Mangini as his defensive backs coach. Mangini, who won three Super Bowls with the Patriots, turned down defensive coordinator positions with the Miami Dolphins, Oakland Raiders and Cleveland Browns before accepting the role with New England in 2005. Mangini, 35, became the youngest head coach in the NFL when he was hired by the New York Jets on January 17, 2006, to replace Herm Edwards. He beat internal candidates Donnie Henderson, Mike Heimerdinger and Mike Westhoff and external candidates Jim Haslett, Mike Tice, Tim Lewis and Joe Vitt for the job. He was quickly nicknamed "The Penguin" by receiver Laveranues Coles because of his waddle and fierce stare. In his first season, Mangini led the Jets to a 10–6 record and a postseason berth with NFL Comeback Player of the Year quarterback Chad Pennington. The Jets, who finished the previous year 4–12, lost to the New England Patriots in a wild card playoff game. The Jets went 4–12 in 2007, failing to make the playoffs. Early in the regular season, Mangini complained to league officials that Belichick's Patriots illegally filmed the Jets' defensive signals, exposing the "Spygate" scandal. In 2008, a late season collapse—the Jets missed the playoffs despite an 8–3 start—led to Mangini's firing on December 29, 2008, one day after the season ended. Mangini was hired as the head coach of the Cleveland Browns on January 7, 2009, signing a four-year deal. Mangini faced early criticism in his tenure with the Browns for his tendency to micromanage the team and his disregard for the team's history (one of his first acts was to tear down a mural of Browns' greats on the wall of the team office). Sports Illustrated columnist Joe Posnanski went so far as to call Mangini's hiring by the Browns as the worst coaching hire from the past 25 years. In his 2013 memoir, former player Nate Jackson, who was briefly part of the Browns' practice squad during the 2009 preseason, sharply criticized Mangini. Jackson wrote that Mangini's coaching style had so alienated his players that they seemed "deep in despair" with "no fight left in them" only a few months after Mangini took over. After starting his first season in Cleveland 1–11, the team bounced back with a win over their division rival and defending Super Bowl champion Pittsburgh Steelers. This started a four-game winning streak to end the season with a 5–11 record. On January 7, 2010, it was announced that Mike Holmgren had decided to retain Mangini as head coach of the Browns for the 2010 season. Mangini's second season was highlighted with back-to-back upsets over the defending Super Bowl champion New Orleans Saints and New England Patriots. The Browns were forced to start rookie quarterback Colt McCoy due to injuries to starting quarterback Jake Delhomme. The season also saw the breakout of running back Peyton Hillis. These developments, however, did not amount to any marked improvement, as the Browns once again finished 5–11. On January 3, 2011 Mangini was fired with a 10–22 record as the head coach of the Browns. Mangini was hired by the San Francisco 49ers as a senior offensive consultant on June 4, 2013. On February 20, 2014, he was promoted to be the tight ends coach. On January 22, 2015, he was again promoted to be the defensive coordinator. However, after just one season, he was released along with most of the coaching staff after head coach Jim Tomsula was fired and replaced by Chip Kelly. 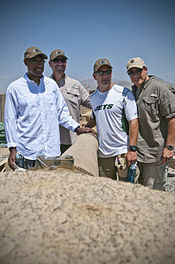 Mangini (far right) with Leslie Frazier, Bill Cowher and Ben Kotwicka in 2012. Mangini and his wife Julie have three sons, Jake, Luke and Zack, whose middle names honor influential figures in his career. Jake Harrison is named after former Patriots' safety Rodney Harrison, Luke William is named after Patriots' head coach Bill Belichick and Zack Brett is named after former Green Bay Packers' quarterback Brett Favre. Zack was born on Favre's 39th birthday, and Mangini had promised Favre that he would name his son after the quarterback if he signed with the Jets. Toronto Blue Jays' president Mark Shapiro is Mangini's brother-in-law and sports agent Ron Shapiro, who currently represents him, is his father-in-law. Mangini had a cameo role in an episode of the crime drama The Sopranos. In the scene, Mangini is referred to by his nickname, "Mangenius". On August 4, 2011, it was announced that Mangini would join ESPN as an NFL studio analyst on NFL Live, SportsCenter, ESPN First Take, and other programs. ^ Andrew Bucholtz (August 8, 2017). "Eric Dickerson joins Fox Sports' crowded group of FS1 NFL analysts". Awful Announcing. Retrieved November 26, 2017. ^ "Eric Mangini takes over as head coach of the New York Jets". Wesleyan Sports Information. January 17, 2006. Archived from the original on July 8, 2008. Retrieved March 16, 2009. ^ Solomon, Jerome (July 26, 2005). "Winning formula: Patriots' Mangini draws on varied past". The Boston Globe. Retrieved March 16, 2009. ^ "Belichick busy filling staff". Rome News-Tribune. February 7, 1997. Retrieved March 16, 2009. ^ Battista, Judy (January 29, 2000). "Belichick Begins Work As Just a Coach For Now". The New York Times. Retrieved March 16, 2009. ^ "Players are all ears in Mangini's class". The Providence Journal. August 30, 2005. Retrieved March 16, 2009. ^ "Jets hire Mangini, NFL's youngest, to replace Edwards". Bloomberg. January 17, 2006. Retrieved March 16, 2009. ^ "Mangini Is Trying to Make Strong Strides With a Waddle and Hum". The New York Times. September 17, 2006. Retrieved March 16, 2009. ^ "Mangini fired after three seasons with Jets". espn.com. December 30, 2008. Retrieved March 16, 2009. ^ "Mangini agrees to coach Browns". espn.com. January 8, 2009. Retrieved March 16, 2009. ^ Posnanski, Joe (September 29, 2009). "Mangini: Worst coaching hire ever?". Sports Illustrated. Retrieved September 30, 2009. ^ Jackson, Nate (August 7, 2013). "Mangini's Mess: Sent to Save the Cleveland Browns, Eric Mangini Instead Put on a Clinic on How to Drive a Team's Morale Into the Ground". Cleveland Scene. Cleveland Scene. Retrieved August 22, 2013. ^ Sessler, Marc. "Niners tab Eric Mangini as defensive coordinator". NFL.com. Retrieved January 23, 2015. ^ Smith, Michael. "Chip Kelly fires Eric Mangini as 49ers defensive coordinator". ^ "As pledged, Mangini gives son middle name Brett in QB's honor". espn.com. October 11, 2009. Retrieved March 16, 2009. ^ "Hiring of Mangini a family reunion for Indians GM Shapiro". The Plain Dealer. January 8, 2009. Retrieved March 16, 2009. ^ "Eric Mangini joins ESPN". ESPN. Retrieved August 6, 2011. Wikimedia Commons has media related to Eric Mangini.